Vatnajökull is the largest ice cap in Europe by volume (3,100 km³). Vatnajökull has around 30 outlet glaciers (icefall) flowing from the ice cap. Svíafellsjökull is one of them. Glaciers are not a playground for everyone. They have its own weather system and the gravity force will destroy everything that get lost in the ice. Two British students lost their lives 1953 in a storm which lasted for 10 days on the glacier. It was not until 2003 that some of their equipment was found, carried forward with the movement of the outlet glacier. No human remains were found. Two German tourist have been missing since 1st of August 2007 when they were on a hiking trip on Svínafellsjökull. Nobody knows what really happened but it is most likely that they fell in a swallow somewhere on the glacier, but their equipment was found in a small valley, high in the nearby mountains. All glaciers have been shrinking fast last decade. That can be easily seen at the end of Svínafellsjökull witch now has a big glacier lagoon that did not exist few years ago. 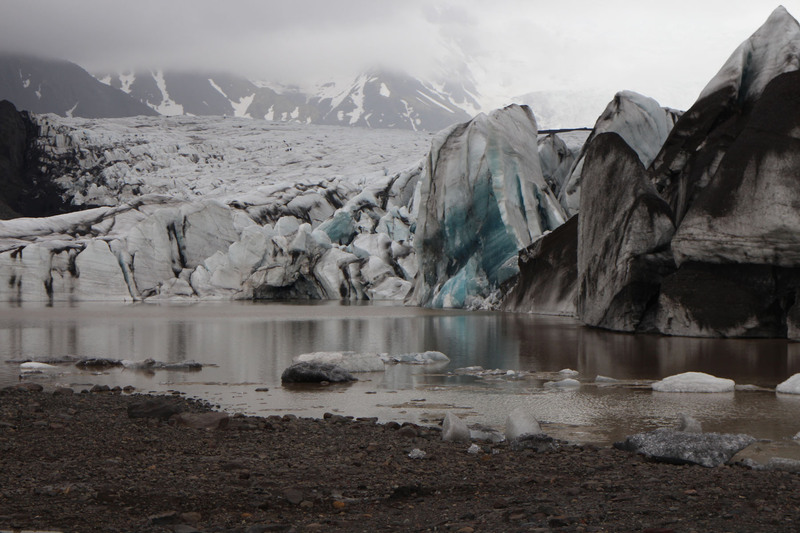 As glaciers the glacier lagoons can be also dangerous. Icebergs can suddenly fall off the icefall and make huge waves in the lagoon, also when icebergs turns around or brake down in a parts. I got in touch of these forces when I was recording the lagoon under Svínafellsjökull, 23rd of May 2014. I hid the equipment from other tourist in a landslide nearby and about two meters above the lagoon surface. Two Aquarian hydrophones where placed in the lagoon and a pair of MKH20 was used to pick up the sounds above the lagoon. The idea was to record in two or three hours. I was in another place with my second recorder to record a sound close by the glacier. After one and half hour I suddenly hear a big „bang“ with a long powerful echo from nearby mountains. All the icebergs on the lagoon suddenly moved around as a beans in a boiling pot. I ran to the recorder´s place on the other side of the lagoon. The bag with the recorder was floating between the Icebergs so it was no problem to locate it in the muddy water. I disconnect the battery and took it inside to dry it as fast as I could. But nevertheless, it had several malfunctions since this drowning. I am not sure what really happened. The flood line does´t goes all the away to the recorder´s place. I think it is most likely that some icebergs pulled the recorder by the hydrophones into the lagoon. Thanks to Sound Devices in US and the reseller in Iceland (Pfaff-Borgarljós and Bragi Kort) I got a new recorder for a very nice price. Most of the loss was then covered by the insurances. Jöklar og umhverfi þeirra getur verið hættulegt þeim sem það ekki þekkjir. Jöklarnir eru síbreytilegir og hafa sitt eigið veðrakerfi. Því ber að umgangast þá með varúð. Skemmst er að minnast hvarf tveggja þjóðverja á Svínafellsjökli þann 1. ágúst 2007 . Mér var það svo sem lika ljóst að jökullón geta verið hættuleg þann 23. maí 2014 þegar ég staðsetti upptökutæki við jökullónið neðan við Svínafellsjökul. Tveir Aquarian vatnahljóðnemar voru staðsettir ofan í lóninu og aðrir tveir MKH20 hljóðnemar ofan við lónið. Sjálfur fór ég með annað upptökutæki til að hljóðrita upp við jökulinn sjálfan. En líklega er aldrei of varlega farið. Eftir u.þ.b. eina og hálfa klukkustund kvað við mikill hvellur frá jökulsporðinum sem bargmálaði í fjöllunum ofan við jökulinn. Stuttu síðar fór allt jökullónið á hreyfingu eins og iðandi suðupottur. Mér varð því ljóst að upptökutækið við lónið gæti verið í hættu. Hljóp ég því sem fætur toguðu að staðnum, en allt kom fyrir ekki. Tækið var komið út í lónið og flaut þar í tösku milli ísjaka. Eftir að hafa þrifið það og þurrkað kom í ljós að tækið hafði bilað varanlega eftir þessa sundferð. Allt bendir til þess að ísjaki hafi dregið tækið í lónið á vatnahljóðnemunum því flóðlínan hafði ekki náð upp að staðnum þar sem tækið hafði staðið. En skaðinn var skeður sem leytist þó á endanum þokkalega farsællega þó tjónið hafi verið eitthvert. Með óútskýranlegum hætti vistaði upptökutækið upptökuna áður en það drukknaði. Það sem hér má heyra eru síðustu andartök tækisins.